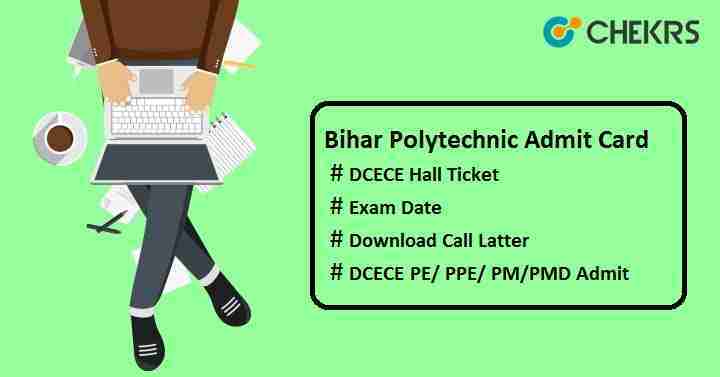 Bihar Polytechnic (DCECE) Admit Card 2019: Bihar Combined Entrance Competitive Examination Board (BCECEB) conducts Bihar Polytechnic (DCECE) every year for candidates seeking admission in to polytechnic courses such as Polytechnic Engineering (PE), Part-time Polytechnic Engineering (PPE), Para-Medical (PM) and Para Medical Dental (PMD). Candidates who will apply for Diploma Certificate Entrance Competitive Examination (DCECE 2019) will have to download Bihar Polytechnic Hall Ticket in order to get entry in the examination hall. It will be made available to those candidates who will submit their application form on or before last date in a successful manner. Here we have provided the complete details related to BCECEB DCECE Admit Card, how to download hall ticket, issue date etc. Candidates can check the Bihar Polytechnic (DCECE) Admit Card Date 2019 here. We have shared the Bihar Polytechnic 2019 exam date along with the admit card issue date so that students can appear for exam on time. BCECEB will issue the Bihar DCECE Hall Ticket through online mode on its official site. Follow the steps given below to download the admit card. Search for the “Download Admit Card of DCECE [PE/ PPE/ PM/PMD] – 2019” link on the home page of official site. Click on option “Click Here” available on the page. Enter Registration no & Date of birth and then click on “Submit” button. Download DCECE [PE/ PPE/ PM/PMD] – 2019 Admit Card and take a printout for further use. Candidates are advised to verify all the details printed on the admit card, in case any discrepancies you may contact immediately to the Examination Controller, BCECE Board Office, I.A.S. Association Building, Patna 1 week before the exam date during working hours 11:00 am to 03:00 pm. Applicants should reach exam center 30 minutes before the reporting time. Do not forget to carry DCECE Admit Card 2019 Download Pdf at the exam center with any one of valid ID proof Aadhaar card/ Driving license/ Voter Id card/ PAN card. Bihar Polytechnic (DCECE) Hall Ticket will be checked by invigilators and after that candidates will get entry. You are advised to keep Bihar Polytechnic Call Letter 2019 safe until the admission is not completed. It will be required during counselling. Do not write anything on the admit card. You can only sign on it in front of invigilator. Hope you get useful details related to Bihar Polytechnic (DCECE) Admit Card 2019. Still you have doubts regarding admit card, admit card relaese date, download steps, you can ask your question in the below comment section. We will respond you soon. Good Luck!!! Keep visiting this site to get latest updates.